Pep Boys IRL driver Eddie Cheever brought the field to the green flag. Going into turn one the pack stayed bunched up and cheever maintained the lead. Gordon lost a few spots and Earnhardt was in ninth and Martin was in eighth at the end of lap one. Lap three and Jeff Burton took the lead from Cheever just as Greg Moore hit the wall while in seventh place. Moore got loose in turn two as Earnhardt came up from behind. The scoring will reflect the last completed lap so Cheever went to the head of the field. The green flag flew to restart on lap three with Cheever in the lead, Jeff Burton in second, Dave Marcis in third with Dale Jarrett and Bobby Labonte rounding out the top five. Martin was in tenth and Earnhardt in eighth. Cheever once again took the lead through one with Burton in tow. Earnhardt moved to seventh and Martin was in fourth. Gordon moved into fifth. Labonte coming from ninth took the lead on lap 5. Lap six and Cheever blocked Martin's attempt to take second in turn two as Labonte started to pull away. Finally, both Martin and Gordon got by Cheever on the backstretch. At this point the racing settled down a bit and the drivers prepared for the next round of dicing. But only after Mark Martin took the lead by going around Labonte in turn three on lap 9. Lap 10 and the top of the order was Martin, Labonte, Gordon, Cheever, Earnhardt and Burton. The top four were running together with the next group, led by Earnhardt, about one second back. At the halfway point the top of the order was Martin, Labonte, Gordon, Cheever, Earnhardt and Burton. Martin was doing what he needed to do to win the championship by leading the most laps and winning the race. Earnhardt was doing what he needed to do for the championship by running eighth or better. Lap 22 and the dicing began again, this time behind Earnhardt. Marcis taps Earnhardt from behind but to no avail, Jarrett got by Marcis. Jarrett got by Earnhardt on lap 26. But Earnhardt got back around in short order. At the conclusion of lap 27 the top four remained unchanged with the next group about one second behind. Lap 28 and the fifth spot began to get some attention as Earnhardt, Jarrett, Burton and Wallace go as a four pack to turn three. Jarret came out the better for it taking fifth away from Earnhardt again. Lap 30 and Wallace and Burton go by Earnhardt pushing him back to eighth. Earnhardt could not afford to loose another spot and win the championship as Martin still led with Gordon in second and Labonte in third. With five laps to go Earnhardt was in eighth with Martin in the lead being challenged by Jeff Gordon. Martin had already collected five bonus points for leading the most laps and was looking for his ninth series victory. Coming to the finish Martin tried to break the draft down the backstretch on lap 38 as Eddie Cheever got by Bobby Labonte for third. On the white flag lap Martin continued to the checkered and Earnhardt finished eighth. Wallace and Jarrett went at it for fifth with Wallace coming out ahead. 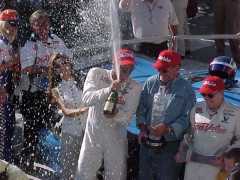 Dale Earnhardt, with his eighth place finish won the 1999 True Value IROC Championship. ** Dave Marcis substituting for Adrian Fernandez who was injured in Detroit this morning. August 6, 1999 - StockCarFans Newsletter - True Value International Race Of Champions officials have announced that longtime test driver Dave Marcis will replace the injured Adrian Fernandez in the 40-lap IROC at the Indianapolis Motor Speedway at 4 pm today. Fernandez was injured this morning during practice for Sunday's Championship Auto Race Teams event at Detroit. Fernandez is currently undergoing X-rays for arm and wrist injuries. The extent of his injuries is unknown. This is Marcis' first IROC start since June 17, 1978 at Michigan Speedway. Marcis will start today's IROC at Indy in fourth position.